This is a higher level skill… some people think it’s a cool skill to have snappy comebacks and to be able to return insult for insult, but keeping quiet? That’s one that takes skill and experience. And this may not even be about an insult, but simply letting something go… when someone makes a mistake or misspeaks… you don’t always have to correct them. They’ll probably realize in a little while they made a mistake. Or maybe it’s someone who feels they need to correct you, even when you know you’re right. Or the blame game? Or “getting the last word in?” Letting these things go without a fight can be tough, and surprisingly rewarding. It’s most rewarding because it makes room for everyone’s blood pressure to drop and tensions to lessen. It creates a less competitive, hectic space. This entry was posted in October 2012 Civility and tagged Civility, keeping quiet, letting it go, quiet. Been saving this little dandy for that day when nothing comes to me… and that day was today! Woot for cool old sayings attributed to far away places! And it fits the civility discussion so well! 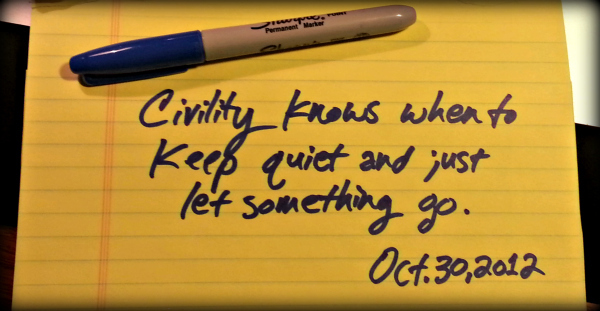 This entry was posted in October 2012 Civility and tagged Civility, Listening, turkish proverb. Indeed, simple courtesies are the building blocks of civil discourse. These small habits engender a sense of dignity to a conversation and display an intrinsic respect for the other participants. Want to build personal credibility? Be thankful and gracious when you speak to people. Even in moments of disagreement being courteous allows the discourse solid traction to keep moving forward. Somewhere along the way someone started acting like “being right” completely overshadowed “acting right” or “speaking right.” The idea caught on, and a win at all costs attitude developed in our manner of discourse and disagreement that leaves no room for courtesies. It looks and acts something like this: “If I am right, then you are wrong, and therefore you are not deserving of my courtesies, and I am not obligated to be courteous, especially if my good manners might steal some of the impact of my superior ideas.” Sound like anyone on the radio you’ve heard recently? I’ve heard that attitude spoken on both sides of the aisle, right and left! A Presbyterian friend of mine once made a self-deprecating joke about his denomination’s tendency to be slow to adopt changes and fast to assemble committees for long and multiple meetings, he said, “We Presbyterians are the ones who can miss an opportunity to do right because we’re so focussed on doing it right.“ I get what he’s saying, and I can chuckle with him at the joke, but I also have to give some grudging respect to the attitude of doing things well. This entry was posted in October 2012 Civility and tagged Civility, courtesy, good manners, please, thank you, you're welcome. Shaken fists, scowling, narrowed eyes, pointing fingers… all these work to lower the civility of our discourse. We can often be forgiven the more subtle things like folded arms and blank stares, but the very aggressive stuff needs to be curbed if we want to raise the level of our civility. Some people think civility is the same as “tact,” or worse, it’s “not saying” what needs to be said. Civility is not only saying what needs to be said and as it needs to be said, but also includes the total package of our presentation. Uncivil body language can end our discourse as fast as name calling or shrill yelling. This entry was posted in October 2012 Civility and tagged body language, Civility.